Fairs & Festivals in Agra reflect the cultural ethos of Agra, the city of the Taj Mahal. Agra district has many rural areas that are greatly influenced by the religious and sentimental attachment to the surrounding areas of Mathura and Vrindavan to Lord Krishna and Radha. Most of the fairs and festivals organized in the region are either temple festivals, religious festivals or cattle and village fairs based on Krishna's life such as Dauji ka mela, Kans lila, cattle fair Jat Devi, cattle fair Kund Mela, cattle fair Gwal Balba, Meta ki Puja Jat Devi, Holi Milap, Mata-ka-mela, Shitla Mela, Parikrama of Shivji, Kailash Mela, Janamashthmi, Dussehra, Kali-ka-mela, Ram lila, Urs Sufi Sahib and Bateshwar cattle fair. However, we have brought you the most famous of these fairs and festivals of the region. 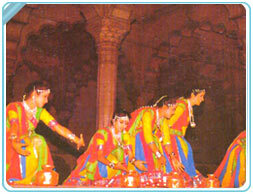 Much famous and beloved cultural festival of Agra, Taj Mahotsav is organized annually for ten days during February. Shilpgram (the Crafts Village), the chosen venue for this fair is close to Taj. Here, one can find extensive display of arts, crafts and culture of India along with classical dance and song performances. 'Mushairas' and 'Ghazal' programmes by the well-known Indian artists. Children love to ride on camels and elephants in the vene while one can taste traditional Indian delicacies at the luring stalls here. The colorful celebrations welcome the Spring with a fiesta of Indian cuisine, dance and music, cultural displays and exhibition of arts and crafts. A brainchild of Uttar Pradesh Tourism, Taj Mahotsav is an event to lure the tourists and acquaint them with the legendary skills of Indian master craftsmen and the finesse of Indian fine arts. It also showcases the rich heritage of India. It commences with a splendid Mughal-style procession highlighting bedecked elephants, richly adorned camels, drumbeaters and folk artists. Taj Mahotsav is best play to witness marble inlay work, wood carvings from Saharanpur, brass wares from Moradabad, handmade carpets of Badohi, the blue pottery of Khurja, the Chikan work of Lucknow and the silks of Banares, all at one place. The Crafts Fair and the Food Festival of Taj Mahotsav have their own charm. The folk dances such as Dundelkhand and 'Nautanki' of Uttar Pradesh, 'Sapera' dance of Rajasthan, the dance of snake charmers and Lavani of Maharashtra have always captured the attention of tourists. Bateshwar is just 70 km from Agra and is names so after the presiding deity of the region, Bateshwar Mahadeo. It is an important spiritual and cultural centre boasting of 108 temples of the various gods and goddesses of Hindus. Bateshwar Fair is organized here annually during the months of October or November in the honor of Lord Shiva for a month. Thousands of devotees visit the venue to take holy dips in River Yamuna and participate in the Livestock and Cattle Fair, which is famous in the nearby areas. The special marriage procession of Sri Ram, held annually at Agra, is known as 'Rambarat' and precedes Dussehra. It is a part of 'Ramlila', the staging of life of Rama that ends with killing of Ravana, on the day of Dussehra. Its specialty lies in the beautiful 'jhankis' of the deities and the special set of the palace arranged at the chosen venue as 'Janakpuri', the palace of Raja Janak who was the father of Goddess Sita. A major fair is organized in the locality and thousands of people visit the venue to see the fair and attend the elaborate royal wedding of the divine deities. The procession starts from Lala Channomalji Ki Baradari for the Janakpuri venue and passes through different parts of the town. Special chariot covered with silver leaves is used as the mount of Ram while his brothers mount the elephants. The elaborate and heavy headgears look stunning. Teenaged boys play the female characters of the drama. Held at Kailash temple in the honor of Lord Shiva, 12 km from Agra, Kailash fair is celebrated to commemorate the appearance of Lord Shiva in the form of a stone lingam here in the monsoon months of August and September. The major fair attracts devotees from all the nearby areas.